Delve into Sydney’s Drunken History & Enjoy a few along the way! A unique sunset swagger filled with notorious history, premium drinks and classic Sydney pubs – join us for a delicious taste of Sydney’s drunken beginnings and the legends of its local haunts. WHERE: Taking place in The Rocks & Miller’s Point. We will visit 4-5 historic pubs while exploring the back alleys, haunts and hide-outs early Sydney’s scallywags. WHAT: Tales of debauchery, notorious convict crimes, shocking Sydney murders, spirit smugglers, people smugglers, local legends, backstreet gangsters and the little known history of RUM and its effect on world! DURATION: 2.5 – 3 hours. DRINK INCLUSIONS: 4 drinks (2 premium spirits & 2 craft beers*) Top shelf stuff — This tour takes its drinks seriously. COST: $95 pp (two person minimum per booking). $75 pp for private groups of 5 – 10 people. GROUP SIZE: This tour is designed for a 2 person minimum and a 10 person maximum group size. History and drinking have always gone hand-in-hand in Sydney and The Rocks is where it all began.While some convicts brewed beer in secret, their jailers rolled in rum by the shipload. With 65 000 litres arriving on the First Fleet alone! In the fledgling, port-side convict colony, it wasn’t long before hard liquor became standard currency and no good story started without it. Welcome back to that time! 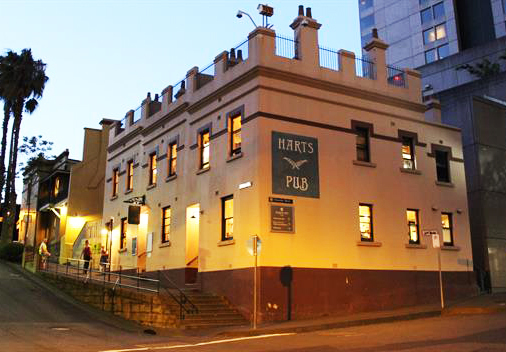 Pub by pub – we’ll dig up the stories behind Sydney’s spirited heritage. We’ll learn of its ruffians and we’ll uncover their despicable deeds. Part tour and part sunset swagger, this unique adventure will bring to life the notorious history and debaucherous tales behind the sailors, soldiers, convicts, cut-throats and larrikins who would do anything for a drop of the good stuff. Best of all, we’ll enjoy premium spirits and delicious local beers along the way.With a good drink in your hand and a great guide at your table, there’s no better way to experience Sydney’s history.So grab your fellow rascals and book yourselves onboard! All participants on this tour must be over the age of 18 and must carry proof of age identification with them at all times. If any participant is deemed to be intoxicated or is refused entry into any pub along the way, they must leave the tour and will forfeit any remaining drinks / pubs entrances that may be outstanding.